I make additions and corrections to this web site frequently, but because they are buried somewhere on one of the pages the changes are not very noticeable, so I decided to create this blog section to highlight significant new material. Here below you will find part of one of the pages that I have either changed or added to significantly. The main page on Borgel can be found at The Borgel Watch Case Company of Geneva. The usual Borgel screw case split stem with pin set for hand setting was perfectly satisfactory and continued to be used for many years. However, winding and setting using only the crown, called stem winding and setting, became increasingly popular, especially after the sliding sleeve mechanism had been invented in 1845 by Adrien Philippe, later of Patek Philippe. This made watches with the pin set olivette and pin on the side of the case look increasing old fashioned. The Borgel Company seem to have been reluctant to change the design of the Borgel screw case to incorporate stem setting, and pin set Borgel cases seem to have been made right up to the 1940s. However, there were a few attempts to make Borgel screw cases with stem setting. This section discusses three of them. 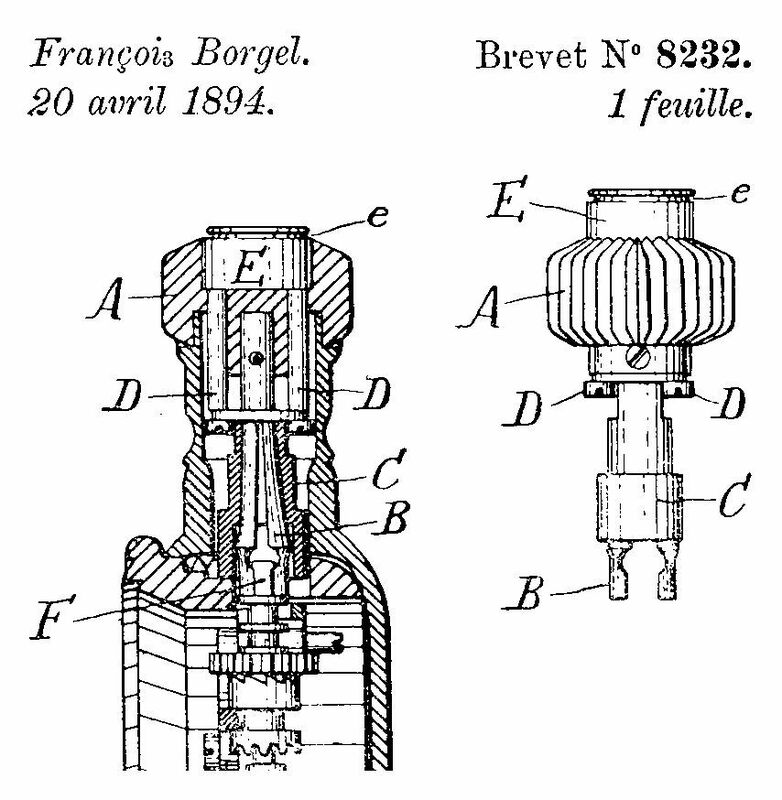 It was not easy to make a Borgel screw case with stem winding and setting, but in 1894 François Borgel was granted Swiss Patent CH 8232 Montre perfectionnée à boîte vissée et tige brisée [Improved watch with screw case and split stem] for a Borgel screw case with stem winding and setting. The image here shows two of the drawings from the patent. The essence of the idea is that part "B" of the case stem has a pair of jaws on its lower end that can grip the end of a short stem "F" in the movement, much like the square socket in the end of a normal Borgel case stem engages with the square end of the movement stem. The normal Borgel stem only couples the case stem and movement stem rotationally. The design shown in the patent adds axial coupling so that the crown and case stem can pull on the movement stem as well as turn it. The jaws of part "B" are made so that they normally spring apart. The sleeve "C" has an internal taper and when it is pushed down over part B it causes the jaws to close and grip the end of the movement stem. This couples the case stem and the movement stem both rotationally and axially. 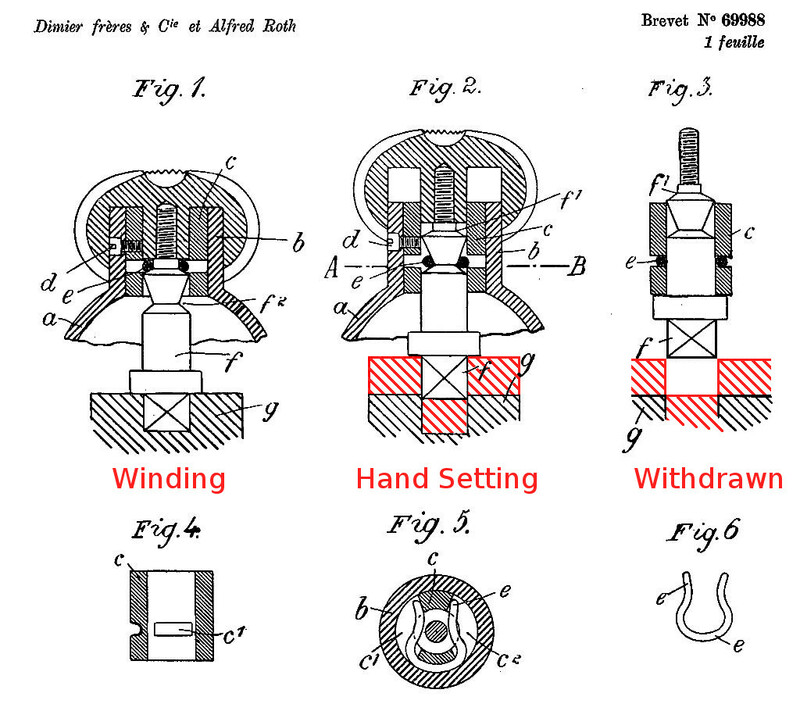 The figure on the right of the drawing shows the arrangement with the plunger "E" withdrawn, which draws part "C" upwards and allows the jaws "B" to spring open. The figure on the left shows the case stem in place. Plunger "E" has been pushed down so the sleeve "C" has closed the jaws of part "B" onto the end of the movement stem "F". I have never seen a Borgel watch with this particular stem set arrangement, and the reason seems pretty obvious when you consider that the whole mechanism would have to fit within the crown and stem tube, which are only a few millimetres across; the individual parts would be minute. Although the Swiss watch industry was capable of making parts on a small scale, this applied to only a few specific parts of a watch mechanism, and the techniques and tools for making these minute parts had been developed over many years. The tools and techniques were employed by specialists who spent their whole working life learning first how to make one specific part, and then practised making it over and over again. The Swiss watch industry at the end of the nineteenth century was not capable of general purpose micromachining, unlike today with computer controlled general purpose precision lathes and milling machines. I think the design in this patent was fine in theory, but impossible to manufacture at the time. The Borgel watch shown in the image here does not have a pin set, so it must be stem wound set. Somebody evidently succeeded in producing a stem setting mechanism that works with the Borgel case. The 15-jewel Swiss lever movement bears the initials D.F. & C in an oval which was registered by Dimier Frères & Cie in 1896. This company was founded as Georges Dimier SA in La Chaux-de-Fonds in the mid-nineteenth century. It became Dimier Frères & Cie when Georges died and his sons took over the company. It seems that Dimier Frères & Cie did not actually make any of the watches that bear their trademarks but were a large and important Anglo Swiss import / export company. The clues to the working of the mechanism are contained in the case back. There are London Assay Office import hallmarks for silver with the date letter “b” for 1917/18, and the sponsor’s mark of “DBS,” which Priestley records was first entered in 1907 by George & Edward Dimier of Dimier Brothers & Co., Watch Importers of 46 Cannon Street, London. There is also a reference in the case back to a Swiss Patent, No. CH 69988. This patent was applied for by Dimier Frères & Cie and Alfred Roth on 16 December 1914, and granted on 3 January 1916. It seems likely that the idea was generated by Roth who then approached Dimier Frères, who liked the idea and sponsored the patent application. The patent describes a way of applying stem setting to a Borgel screw case watch. The patent does not actually mention Borgel cases specifically; it merely says that the design is “applicable to watches with hermetically closed cases for which it is necessary to avoid a lateral constraint”, i.e. cases that have the movement screwed in, where the "lateral constraint" of a normal stem would not be possible. The diagrams from the patent show how this was achieved. The original figure was rather hard to understand, so I have moved its elements around to juxtapose them more logically. In Figs 2 and 3 the draftsman has made a mistake which I have corrected in red. The patent shows the split stem we would expect to find in a Borgel watch, with part of the stem in the movement and a short case stem attached to the case. Instead of the two positions of the usual Borgel case stem and crown, this one has three positions: the normal one with the crown against the case, a middle position with the crown case stem partly withdrawn, and a fully withdrawn position that enables the movement to be unscrewed from or screwed into the case. The movement has “negative set” keyless work. The keyless work is spring biased so that when the movement is out of the case it is put into the hand-setting position. To put it into the “normal” winding position when the movement is in the case, the stem presses the keyless work inwards against the action of the spring. This position is shown in Fig. 1. The case stem "f" and the cross hatched element "g", which represents the part of the stem in the movement, are held in this position, against the pressure of the spring in the keyless work, by a detent mechanism comprised of the spring "e" (shown in plan in Fig. 6) and a shoulder on the case stem. Fig. 2 shows the case stem withdrawn to the hand setting position. In Figs 2 and 3 the draftsman has made a mistake which I have corrected in red. In Fig. 2 the part of the stem "g" should have, under pressure from the spring in the keyless work, followed the split stem "f" as it was withdrawn to the middle hand-setting position. In Fig. 3 the stem "g" remains in the same position as in Fig. 2 when the case stem is fully withdrawn to allow the movement to be unscrewed from the case, or screwed in. Negative set mechanisms usually used a sleeve made of spring steel set in the watch pendant to achieve the same function as spring "e". The sleeve has four slots cut into it to form spring “fingers” which grip the case stem and hold it in the winding or hand setting position. The Birch & Gaydon Land & Water wristwatches used this type of mechanism. It is not clear why the Dimier Frères patent design used the spring "e" instead of a sleeve. This spring is the Achilles heel of the design, being so small and without adequate provision for lubrication that it wears quickly. The watch shown above has Dimier Frères' trademark on the movement and the “DBS” sponsor's mark entered by Dimier Brothers & Co. on the case, which ties in nicely with the patent and suggests that this watch was made to Dimier’s orders. 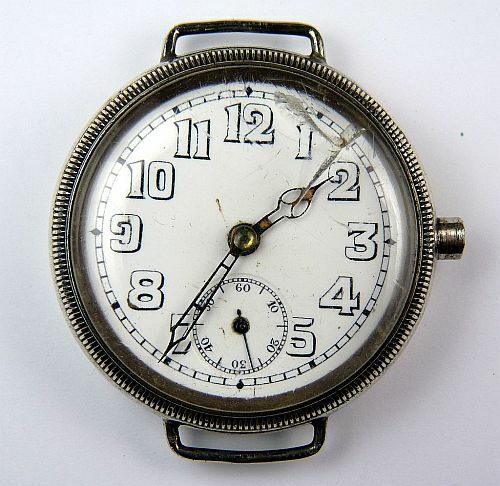 Longines and Rolex watches are sometimes also seen in Borgel cases without the pin-set for hand setting, which perhaps involved paying a licence fee to Dimier Brothers. Marcks & Co. Ltd. Borgel Watch. The image here shows the case of a watch owned by Pierre Mannaert that is marked on the dial "Marcks & Co. LD, Bombay and Poona, Swiss Made". The dial is white enamel with radium luminous numbers, the yellow appearance is due to ageing of the crystal. The crystal may well be the original celluloid one, the ageing no doubt helped by radiation from the radium luminous paint. 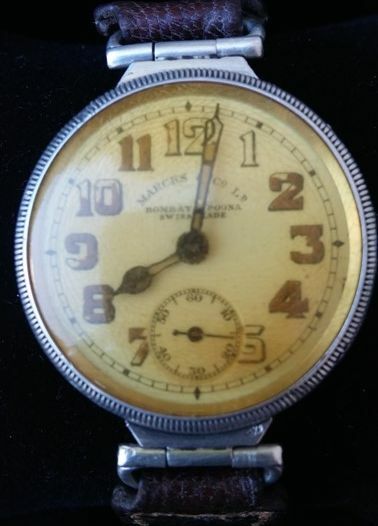 Marcks & Co. described themselves as watchmakers, jewellers and opticians, although I think that they were pure retailers and certainly didn't make watches. The case is marked inside with the Borgel Company FB-key trademark, and Swiss bear and 0.935 silver hallmarks. The movement was made by Fontainemelon and carries the Swiss patent number 51482. This patent is for a stem setting keyless mechanism and appears on many Fontainemelon movements of this period. The movement is stem set, unlike the pin set movements found in most Borgel screw cases. The case is identical in most respects to the normal Borgel screw case, except that it has no pin set and has a small threaded hole set into the back. This hole allows access to the setting lever screw of a conventionally stem set movement, which allows the long one piece stem to be released and withdrawn so that the movement can be unscrewed from the case. When the movement is screwed back into the case, the stem is inserted and secured in place by turning the setting lever screw. The hole is then filled with a threaded plug. The case back has been built up in thickness around the hole to allow several turns of thread to be cut for a secure fixture. When I first saw this I wondered if it was a modification, but the case and the movement carrier ring have no holes where a pin set would have been. It is clear that the case was manufactured like this to take a stem set movement. Making a hole in the case back to allow access to the setting lever screw of a movement with a conventional stem set movement, and then fitting this with a removable plug, would be an obvious way of fulfilling a demand for stem set watches. There are no obvious objections to doing this and one has to wonder why there aren't more Borgel watches like this around. There seems to have been a reluctance within the Company to alter the original Borgel screw case in even a simple and obvious way like this. Dating this watch exactly is difficult. The Swiss hallmarks of a single bear and 0.935 allow of quite a range of dates. I would guess a date of circa early 1920s, when we know that the Borgel Company under Louisa Borgel and then the Taubert family were experimenting with new and improved designs. It seems likely that this was an early attempt to improve the original Borgel screw case. That this is the only one which appears to have been seen suggests that the project was quickly abandoned in favour of different or completely new designs. I wonder how many more examples are out there, it seems unlikely that only one was made.